Choosing your wedding shoes is an important part of designing your ideal bridal look. If you have a short dress, your shoes will be prominently on display for all to see. Even if you have a long dress, you will probably have to lift the hem of your dress to walk upstairs (or for your groom to remove your garter!) and your shoes will be visible to everyone. In order to perfectly round out your bridal beauty, then, finding the perfect wedding shoes is key. Here are a few suggestions to keep in mind as you begin shopping for your bridal shoes. Follow these guidelines, and we guarantee the perfect shoes will be carrying you down the aisle in no time! You can't choose your wedding dress without considering what kind of shoes you want to wear, and vice versa. Your style of dress will have an impact on the style of shoes you choose for your big day, and the height of your heels will impact the ideal length for your dress. It's important to wear your chosen shoes to your final dress fittings so you can see exactly how the hem of your dress is going to fall. The setting and climate will also dictate the type of shoe that will be perfect for your big day. If you're getting married on a beach, you may want to shoot for sandals, wedges, bridal flip flops, or other shoes that have a beautiful but casual feel. If your wedding is extremely formal, your shoes will need to reflect that as well. Finally, if you're getting married in winter or in a very cold climate, you may want to consider boots or other shoes that will keep your feet warm. Don't choose your wedding shoes without taking time to first be realistic about your setting and climate. They certainly can be, but they definitely don't have to be. If you're looking for unique ways to really make your wedding your own, then it might be time to think about brightly colored wedding shoes. For example, some brides choose shoes that match the color of their bridesmaid's dresses. Others choose classically subtle colors such as beige, pale pink, off-white, or silver. When it comes to choosing the color of your wedding shoes, the sky is truly the limit. 4. To Bling Or Not To Bling? That is entirely up to you! Your shoes can be as decked out as you want, or they can be simple and understated. 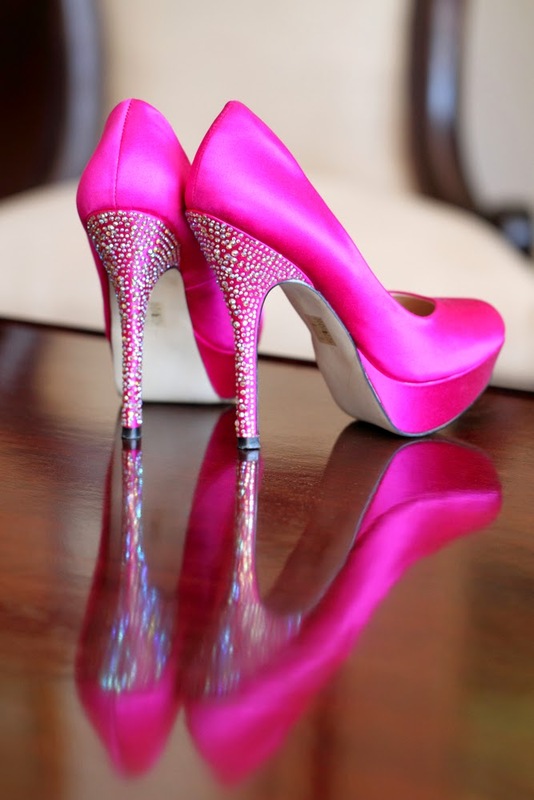 Some brides choose bright, metallic colors for their bridal shoes, or they might find shoes with beautiful rhinestone accents. Other brides don't want to draw extra attention to their shoes, so they choose pairs that don't have any additional bling. Which route will you choose? Beware of falling in love with a magnificent pair of heels that you might not actually be able to wear. As you pose for pictures, walk down the aisle, and perform your first dance as husband and wife, you'll be on your feet a lot on your wedding day (especially if your ceremony is in the morning). No one wants to totter around in heels they can barely balance in all day! Choose a pair of shoes you will be able to stand and walk in easily on your big day. Along the same lines, it's important to choose wedding shoes that you can maneuver in comfortably on your wedding day. As we just said, you're going to be on your feet a lot on your special day, and nothing can ruin that faster than aching feet. If high heels hurt your feet, don't be afraid to rock some flats - or even some funky bridal flip flops! 7. Why Not Wear Your Wedding Shoes Again? There's really only one appropriate occasion to wear your wedding dress, and that's on your actual wedding day. Your wedding shoes, however, could become a new integral piece of your wardrobe! As you select your wedding shoes, keep in mind the type of shoe you'd be likely (and able) to wear again for other special occasions. If you're going to buy them, you might as well get your money's worth! 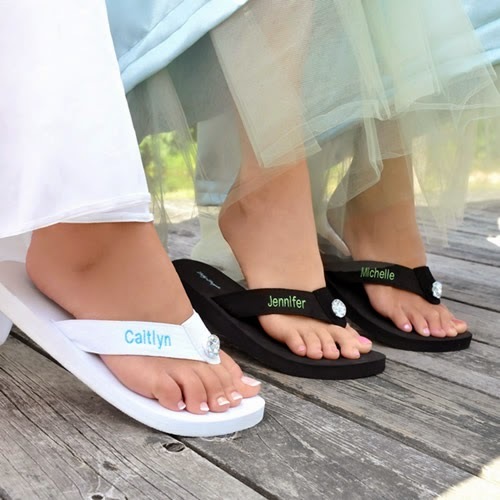 with these personalized wedding flip flops! We've talked about holding true to your personal style when choosing your dress and your makeup/hairdo, and the same thing applies when choosing your shoes. If you've been rocking 6 inch heels since you were seventeen, then skyscraper heels could be the key to finishing off your ideal wedding look. If you've never worn heels in your life, on the other hand, then your wedding day is probably not the best time to start. There's no rule that says you have to wear heels on your wedding day - what matters is staying true to your own unique sense of style. As you begin shopping for your dream wedding shoes, don't forget to have a great time. Which shoes did you choose? We'd love to know!